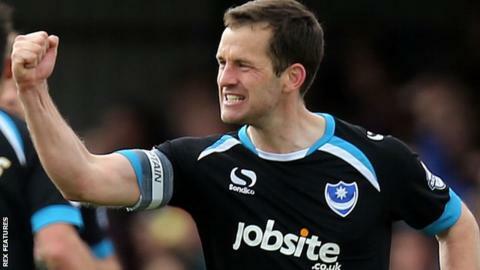 Captain Michael Doyle said Portsmouth finally showed character in their 4-1 win at Dagenham on Saturday. Pompey trailed at half-time with some supporters showing their displeasure. But a second-half comeback sealed the win in what midfielder Doyle described as "a make or break afternoon" for their League Two promotion prospects. "It was a massive confidence booster," he told BBC Radio Solent. "You can either shy away or stand up and be counted, and the lads did that." Doyle, 34, scored the equaliser as Paul Cook's side mounted a response and admitted the victory, which took Pompey within five points of the automatic promotion spots, was an emotional moment. "Since the start of pre-season in June, everything has been focused on promotion," he said. "I've played in teams in the past that have gone under in those sort of frustrating games. But we showed a lot of character and drove on to win. "The fans were rightly not happy with us at half-time, but they have a massive effect for us. They're like a 12th man and will have such an important part to play."